Metro’s closing three stations this weekend starting Friday night at 9:30 and won’t be re-opening them until Tuesday morning at 5am. Those three stations are National Airport, Pentagon City and Crystal City, which means that a significant branch of the Metro will be traded for buses this weekend while WMATA refurbishes them. They’ll be stripping out 2,000 feet of Rail, 735 ties, and will be working on the concrete platform structures at National amongst other places. It’s a pretty big deal, so service is going to be drastically affected. The line between Pentagon and Braddock Road will not be operated at all. Metro has detailed the shuttle service via their website, and the appropriate section is below, for those who’ll need to transfer around the problems. The Blue Line will operate between the Largo Town Center and Pentagon Metrorail stations, and between the Franconia-Springfield and Braddock Road Metrorail stations. The Yellow Line will operate between the Greenbelt and Pentagon Metrorail stations and between the Huntington and Braddock Road Metrorail stations. All Blue Line trains will operate every 12 minutes during the day on Saturday, Sept. 5, and every 15 minutes during the day on Sunday, Sept. 6, and Monday, Sep. 7. All Yellow Line trains will operate every 16 minutes during the day on from Saturday, Sept. 5, to Monday, Sept. 7. All Green Line, trains will operate every 12 minutes during the day on Saturday, Sept. 5, and every 16 minutes during the day on Sunday, Sept. 6, and Monday, Sept. 7. After 9 p.m., from Friday, Sept. 4, to Monday, Sept. 7, all Blue, Yellow and Green Line trains will operate every 15 to 20 minutes. At the Pentagon Metrorail station from 9:30 p.m., Friday, Sept. 4., to closing (midnight) on Monday, Sept. 7., all Blue Line trains from the Largo Town Center Metrorail station will operate into the upper level of the station and all Yellow Line trains from the Greenbelt Metrorail station will operate into the lower level of the station. From Friday, Sept. 4, to Monday, Sept. 7, the last Blue and Yellow Line trains departing the Franconia-Springfield and Huntington Metrorail stations for the Braddock Road Metrorail station will leave 30 minutes earlier than usual. This will allow for customers to connect to the free shuttle buses and to the last trains departing the Pentagon Metrorail station to the Largo Town Center and Greenbelt Metrorail stations. On Friday, Sept. 4, and Saturday, Sept. 5, the last Blue Line train will depart Franconia-Springfield at 1:59 a.m., Van Dorn Street at 2:05 a.m., King Street at 2:10 a.m., and arrive at Braddock Road at 2:12 a.m. On Sunday, Sept. 6, and Monday, Sept. 7, the last Blue Line train will depart Franconia-Springfield at 10:59 p.m., Van Dorn Street at 11:05 p.m., King Street at 11:10 p.m., and arrive at Braddock Road at 11:12 p.m.
On Friday, Sept. 4, and Saturday, Sept. 5, the last Yellow Line train will depart Huntington at 2:04 a.m., Eisenhower Ave at 2:05 a.m., King Street at 2:07 a.m. and arrive at Braddock Road at 2:09 a.m. On Sunday, Sept. 6, and Monday, Sept. 7, the last Yellow Line train will depart Huntington at 11:04 p.m., Eisenhower Ave., at 11:05 p.m., King Street at 11:07 p.m. and arrive at Braddock Road at 11:09 p.m.
Braddock Road Metrorail station. This shuttle bus will depart from the Pentagon Transit Center lower level bus bay #6 and make one stop on Jefferson Davis Highway at 23rd Street in Crystal City. The shuttle bus stop at the Braddock Road Metrorail station is bus bay B.
Franconia Springfield Metrorail station. This shuttle bus will depart from the Pentagon Transit Center lower level bus bay #7 and operate express via I-395. The shuttle bus stop at the Franconia-Springfield Metrorail station is bus bay D.
Ronald Reagan Washington National Airport Metrorail station. This shuttle bus will depart from the Pentagon Transit Center lower level bus bay #8. 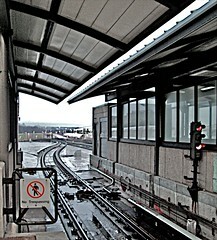 The shuttle bus stop for the Airport station is located on the west side of the rail station between the station and the parking garage. Pentagon City and Crystal City Metrorail stations. This shuttle bus will depart from the Pentagon Transit Center lower level bus bay #9. The shuttle bus stop at the Pentagon City Metrorail station will be at the eastern side of South Hayes Street (across from the Pentagon City Fashion Centre) at 12th Street South. The shuttle bus stop at the Crystal City Metrorail station is on Bell St., north of 18th St. This entry was posted in: Alexandria, Talkin' Transit, The Daily Feed, The District, WMATA, WTF?! What a major fail. Closing National Airport Metro on Labor Day Weekend. Musta been someone pissed they couldn’t leave town who made that plan.